by Robert Kegan, Lisa Laskow Lahey. Harvard Business School Publishing, 2009. Often, you know what to do as a leader. Yet, when you start down the helpful path you hit a roadblock. Or, you change direction. Or, you understandably get off course because of apprehension regarding what uncomfortable thing might happen. Are you interested in how you might change a specific behavior in order to be a more effective leader? Are you seeking to unlock a pattern in your congregation so that a new direction can be tried? 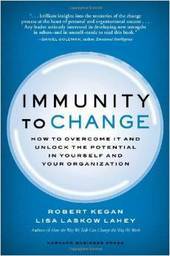 This book, written by two Harvard professors, addresses what they called immunity to change; the tendency for us to employ defense mechanisms when we most need to be courageous. The book is written for a general audience, particularly those who lead organizations. It is easily adaptable to a congregation setting. Kegan and Lahey have developed an immunity map that helps you minimize the disparity between what you intend to do and what you are actually able to bring about. The book provides a way to use the map regarding individual habits, as well as organizational dynamics. If you are interested in addressing one leadership habit that you want to change, or one organizational habit that needs to change, this book will be a faithful companion on that journey.